Fallin Tones Down Rhetoric, But Does It Even Matter? I’m struck by what Gov. Mary Fallin’s State of the State address didn’t include this year. Gone was the sanctimonious lecturing about how Oklahoma was going to teach the federal government a thing or two about good governance. Gone were the cliché calls for “right sizing” whatever needs to be right sized in this state. Gone were the calls for major tax cuts aimed to increase the take-home income of Oklahoma’s most wealthy people. 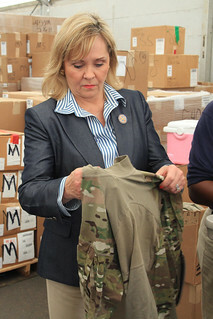 Fallin did argue, “Our people are known nationally – and internationally – as ‘Oklahoma Strong. '” This was in reference to our responses to all our natural disasters, and I don’t want to quibble too much here, but in all my travels outside the state I’ve never heard the “Oklahoma Strong” mantra from anyone at all, ever, and I don’t expect I ever will. Many people outside the state know us, really, only for people such as science unbeliever U.S. Sen. Jim Inhofe or the LGBT intolerant state Rep. Sally Kern. What we had then was a rather bland but competent speech, and I actually mean this in a fairly positive way, that drew attention to education and health issues, but came with the important and mostly unspoken caveat that state agencies were going to face budget cuts of approximately 6.25 percent and education funding was pretty much going to remain stagnant even though the state faces a major teacher shortage. There are many things we can and must do to increase education levels in Oklahoma. Whether it’s raising academic standards to ensure our high school graduates are actually graduating with 12th grade level skills, increasing funding – which I support – or finding ways to empower parents and students, we must do more. I look forward to working with educators, parents, and our new Superintendent of Public Instruction Joy Hofmeister in support of those goals. One thing we know we can do NOW, that doesn’t require large sums of new money, is to help strengthen partnerships between local businesses and local schools where students can dual track their education and work skills. Note that reference to the lack of “large sums of new money.” That’s the important part. I sense that as long as Republicans dominate state government here education funding will remain at some of the lowest levels in per pupil spending in the nation. Local businesses are not going to help in any significant way to solve our teacher shortage problems. It costs the state around $19,000 a year to house an inmate, but only $5,000 a year to send an addict through drug court and on to treatment. In addition to being less expensive, it’s also more effective; the recidivism rate for offenders sent to drug court is just one-fourth of the rate for those sent to prison. This is a legitimate argument that I hope receives some attention from the legislature this year, although I’m not hopeful. Most law-and-order state Republican lawmakers still retain a myopic punitive mentality about crime, even for non-violent offenders, rather than a rehabilitation mentality about crime. Fallin, in her last term of governor, can speak as much common sense as possible at this point, but will anyone in her party listen to her and does she really even care that much? Fallin’s call for “performance informed budgeting” and setting various goals for the state seemed overly bureaucratic and perhaps was just filler for her speech. The state has major problems related to health outcomes and education funding. It’s fine to set goals, but without a meaningful budget commitment nothing will improve here drastically. But, in the end, Fallin’s speech could have been worse for progressives, and it did make a salient point or two. « Brand New State! Brand New State!